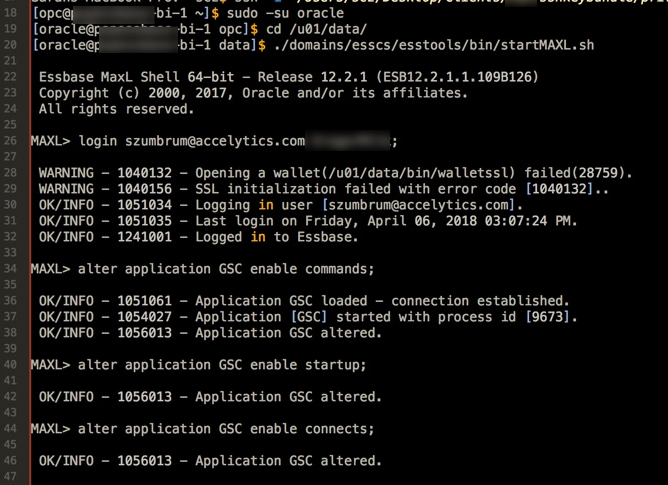 Recently we had an issue on our OAC box where Oracle Support asked us to perform a series of steps to run scripts and obtain logs. This should not have taken days (really) to gather, but because the documentation is both incomplete and scattered, I thought I would document what actually worked so you can do this in a matter of minutes versus days. They all build on each other so it makes sense to lump them together but I’ll still break them down into 3 groups so that if you need just one of the parts, you can access that portion quickly. The first thing you need in order to SSH to OAC is to have a copy of the private key on your local machine. When you created your OAC instance, you should have been given the opportunity to download both the private and public key.Record the location of the private key. I am connecting via a Mac, so I have the built in luxury of SSH capabilities. If you are running Windows, you will need to download puTTY (or something similar) so you can access the boxes. The private key acts as your password for user opc. Once you have done this, you should be able to use the ssh command again with success! From here, you can run normal MaxL commands. python collect_diagnostic_logs.py /tmp/EssbaseLogs.zip**Note that adding “.zip” to the end of the EssbaseLogs ended up being redundant (again, documentation stated differently) so my actual file name ended up being EssbaseLogs.zip.zip. First, create a special connection versus a Quick Connection. Enter your OAC IP address. 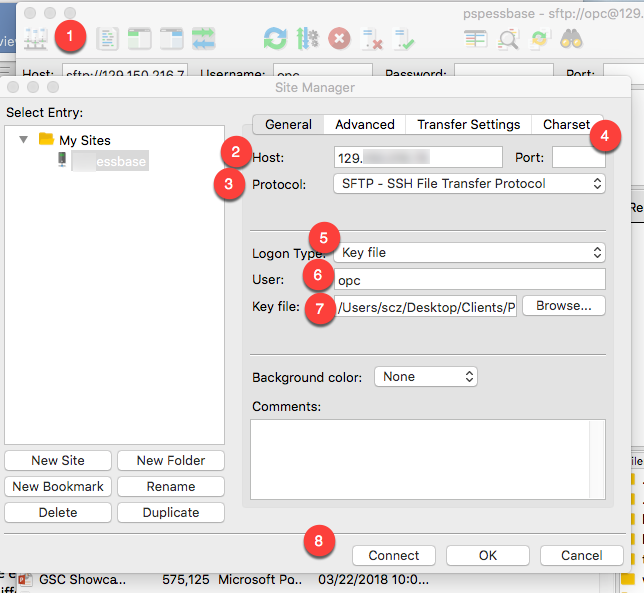 Choose SFTP as the protocol. Choose key file as the logon type (this is password, basically). Browse to your private key for the key file. This will bring up your machine so you can migrate to the log file location then copy to your machine. Upload that file to Oracle Support and you are all set. 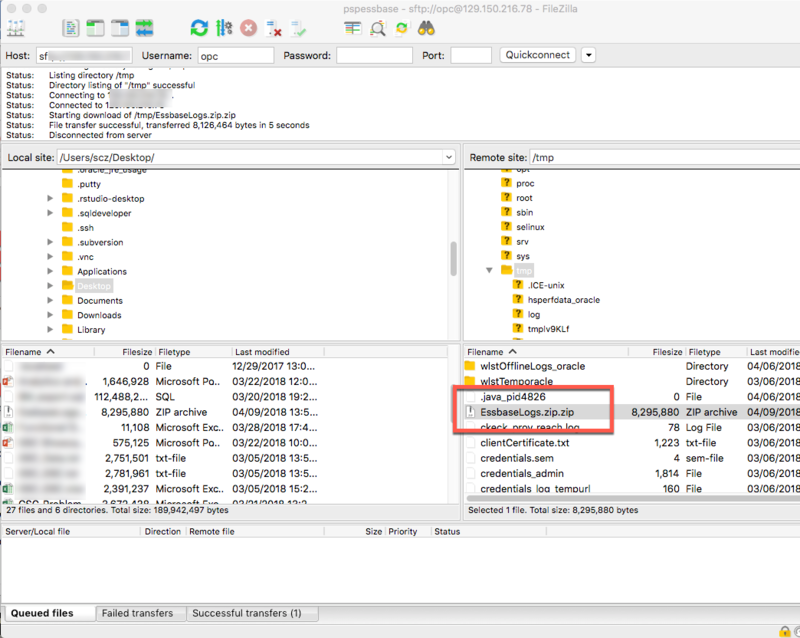 Next Post: Essbase Cloud: Where’s the MaxL Default Data Export Location?